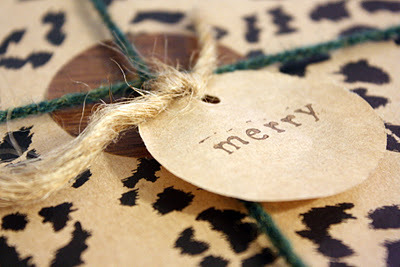 You are here: Home / Holidays / Making A Merry Christmas / DIY Woodgrain Gift Tags! 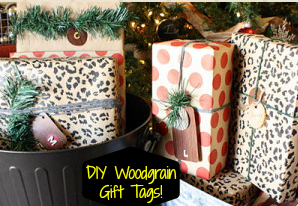 If you still need to wrap up those gifts, I’m going to give you a tutorial for woodgrain gift tags today. 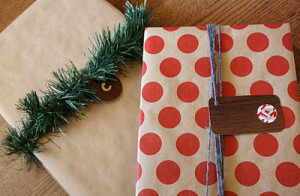 For my gifts, I used: 1. yarn 2. brown masking paper 3. 1-inch circle cutter 4. corner rounder 5. alphabet stamps/brown ink pad 6. silver & gold glittered letter stickers (Target @ $2) 7. hole punch 8. 2-inch circle cutter 9. 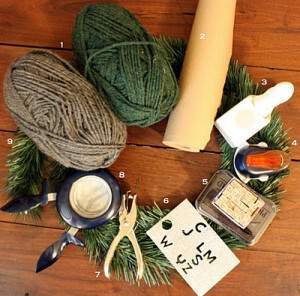 9 foot cheap garland ($1 @ Dollar Tree) Gather your supplies. 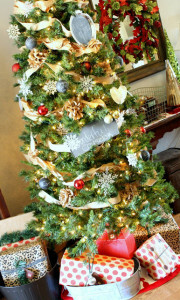 I used the above supplies plus woodgrain contact paper ($1 @ Dollar Tree) and white poster board. 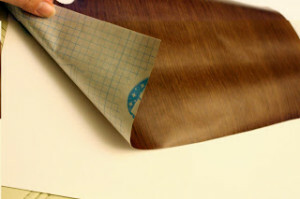 First, I took a section of the contact paper and covered about 1/4th of the poster board with it. 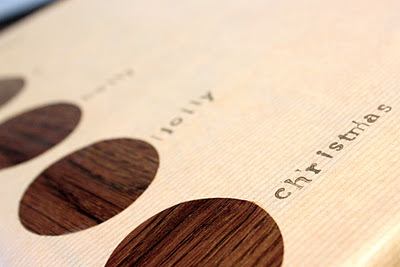 Then I cut various size rectangles and 2-inch circle tags from the (now) woodgrained poster board. 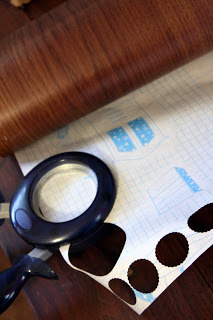 On some of the gifts, I used the 2-inch circle cutter to cut directly from the contact paper. This allowed me to use the circles as stickers for a handful of the packages. Using my tiny alphabet stamps, I stamped words directly on some of the gifts or on round 2-circles cut from the masking paper. 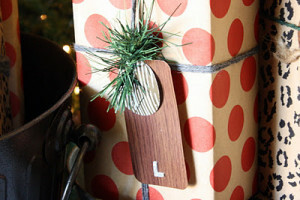 On the remaining tags, I used the glittered letters to add a pretty monogram. 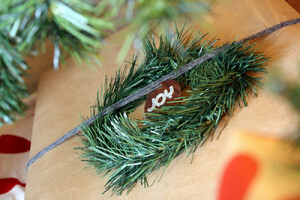 After all of my gifts were wrapped, I used yarn and varying lengths of garland to attach my tags to the gifts. Each package and each tag is different. Anything goes, so have fun with it! I added a large letter j out of garland and a woodgrain sticker (cut from the contact paper with my 1-inch circle cutter) for my hubby’s gift. 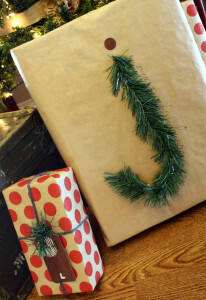 The packages look so festive under my Christmas tree! All that’s left to do is sit back and enjoy this Merry Christmas! Hi, I’m Emily from 52mantels.com. I’m the wife to a wonderful hubby who puts up with my constant projects and I’m the brand-new mommy to one perfect little bow-wearing baby. I’m also a habitual DIY girl with a passion for creating a beautiful home on a budget. When I’m not crafting and creating, I’m planning my next craft or creation. Obsessed? Perhaps. But, I prefer the word focused. I’m focused on making my house a home and doing it creatively. 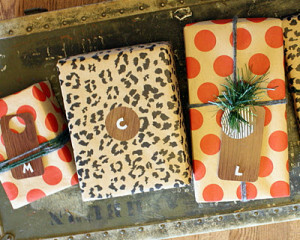 Because, let’s face it, creativity is the best friend of the frugal gal. I’m always up to something at 52 Mantels. Won’t you join me on my journey?